I get a lot of emails asking me where to start with journaling, or wondering which of my e-courses is the best to start with. I thought I would address these inquires in a post with some resources, links and thoughts to help one get started. I hope you find it helpful! My first bit of advice to you is to just try! You do not have to share it with anyone, or even keep it (although I suggest putting it out of sight for sometime rather than tossing it!). Just try a spread and see where it takes you. The one thing I have learned is even when I create a spread and am not happy with it at the time - when I look back at it months or years later, the things I was unhappy with do not even show themselves, all I see is the memory and part of myself that I recorded at that moment. 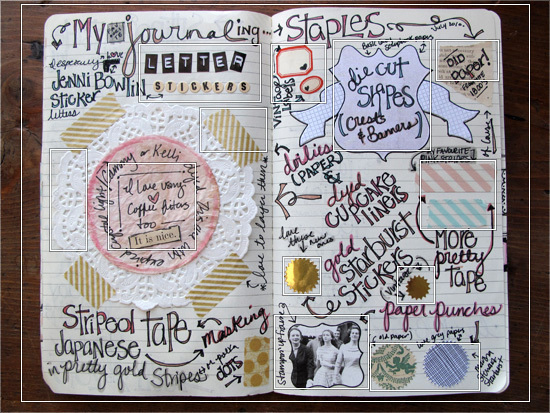 How to Cultivate Your Own Style A post about how to find your own journaling style. Overcoming your Journaling Fears To help those that let fear keep them from starting. - Images that you can print to use in the two step by step spreads - the same images I used in mine. - 4 Journaling prompts and 4 mini prompts, along with my spreads of the same prompts - photographed, and videos showing how I create them. - And more, see the full list (and sign up) HERE, the above is just what I think is best for beginners. You can see all the e-course I offer by clicking HERE. There are a lot of wonderful art journalers out there. Start a Pinterest board with images that inspire you. HERE is my Inspiring Journals board. Bookmark or follow your favourite art journalers blogs and visit them often. Feel free to peek into my Journal Gallery , or if you want to see all the journal spreads I have posted on the blog over the years, take a peek HERE. But most of all... enjoy it! No matter what, enjoy the process of creating and documenting. i just found your site but am already addicted.. my mind is racing with ideas! i can't wait to start. and i already bought kraft tags, vintage airmail envelopes, baker's twine, and vintage stamps to use... i'm excited!